After months of rumors, it is finally a reality – the successor of the PPC-6700 can now be ordered from Sprint PCS at the price of $399.99. Interesting fact is that the phone is not offered as Sprint PPS-6800, but as Sprint Power Vision Smart Device Mogul by HTC, clearly showing the manufacturer’s name which was “hidden” in the past, replaced by other phone brands or the carrier’s name. 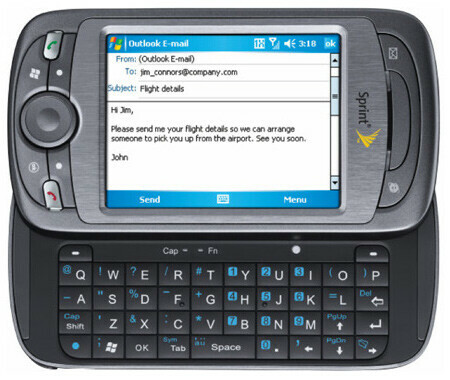 The Mogul is Windows Mobile 6 Professional (Pocket PC) phone with 2.8” QVGA display, side sliding QWERTY keyboard, 2-megapixel camera, GPS, WiFi, Bluetooth, microSD. In the future it will be upgraded to support EV-DO Revision A for faster speeds over the air. Will this phone support VOIP applications like Skype so that I can use it to call home from foreign countries when receiving a Wifi signal? The equivalent phone sold in Brazil does, but I worry that Sprint has blocked that from working. I have played with my friend's phone. I think it puts the IPhone to shame.